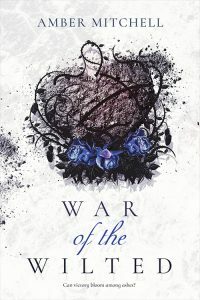 Don’t miss the next exciting chapter in the Garden of Thorns series from Amber Mitchell! 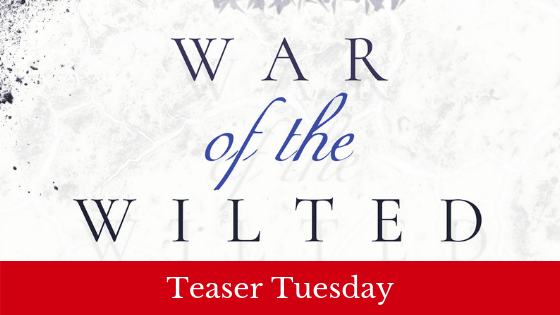 Take a sneak peak inside War of the Wilted and pre-order your copy today. “Tell me, do you think you’re a good actress, Rose?” the Gardener asks. As the words leave my mouth, the squeal of the iron bars behind me rings out in the air. I look over my shoulder, catch Rayce plunging into the darkness towards us. Small fingers grip my hand and I swing back around, trying to jerk away, but the Gardener’s grasp is much stronger than I remember. For a short second, I wonder what he’s doing until the sharp bite of wood presses against my palm right as he jams the pointed part of the chopstick into the fat in his shoulder. He lets out a sharp cry and my eyes widen as blood pours from the self-inflicted wound, sticky and warm on my skin. “S-She attacked me!” he says, taking a step backward. The thunder of footsteps behind me echoes with the Gardener’s cries and still my brain tries to catch up with what just happened. “Rose, no!” Rayce’s voice booms behind me like thunder. Arms wrap around my shoulders and yank me back. I don’t even strain against them, going completely rigid. I hold out my hands as if to show that I don’t have anything offensive on me, but the side of my left hand is covered in blood. Everything in my mind crawls to a stop. The last time I had the Gardener’s blood on my hands, I’d earned it, at least. But this time, he played me. The only thing I can hope for now is that Rayce doesn’t fall into the same trap I just did.